In case you wish to share your memories of HMEM Nubar clubs or AGBU Egypt, please send us your picture(s) with a brief info about the content. Your contribution will develop and enrich our photo album. In what can be considered as a much lauded occurrence, four Egyptian Armenian clubs and cultural associations joined hands to organize a very delightful New Year celebration at the Novotel Cairo Airport hotel, gathering 400 guests in a memorable and delightful outing. The clubs of Homenetmen Ararat, HMEM Nubar Cairo, Goganian and Housaper teamed up; with the financial support of Cairo’s “Kaghakagan” (Executive committee), to pool their resources and organize an enchanting New Year’s eve celebration where most of the familiar faces of the Egyptian Armenian community were present to mingle and dance the night away in great enjoyment and harmony. It was an impressive Egyptian Armenian assembly not often witnessed in Cairo in recent times. The co-hosting four clubs had each mandated 3-4 delegates to work together during the past few weeks for the organization of the different aspects of the event: Reservations, invitations, prizes, decoration, music, seating arrangements, etc.. The celebration started around 9:30 pm on Thursday 31st December 2015. 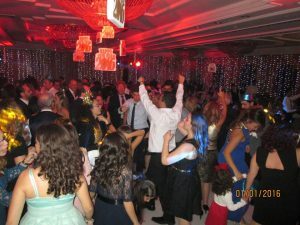 The dance floor was always kept busy and packed thanks to the music of DJ Armen. It was only cleared around 3:00 am to give way to the drawing of lots procedure of the impressive and wide selection of tombola prizes which was handled by Mrs. Marlene Avakian-Avanian. The party resumed thereafter only to wrap up with the early morning lights of 2016. The perfect organization of the event and the delightful event was well worth the praise and acclaim of all the presence and well worth reiterations in the near future. HMEM Nubar Cairo celebrated Khetoum on Tuesday 5th January 2016 in style and elegance with 180 guests gathered at the club house and the partially covered garden to spend some prime time together and to enjoy the festive night in a shipshape decorated interior and a scrumptious food service. The Ladies’ Committee did a tremendous job in organizing the event. The decoration, food, presents and service was all taken care of with utmost commitment. The night ended at around 2:30 am with the raffle prizes in excellent spirits after a fabulous night full of enjoyment and delight in which the dance floor was kept busy all night thanks to the wonderful repertoire of singer George Karkour who allowed the presence to spent a memorable night in blissful surroundings. 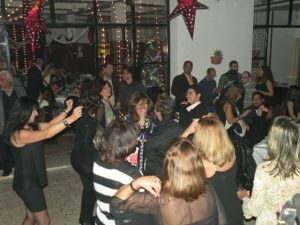 HMEM Nubar Alex also celebrated the holy occasion at its club on this same night of Christmas eve gathering the Alexandrian Armenian community in a lovely jovial atmosphere. AGBU Cairo’s children choir Dziadzan paid a special visit to the Armenian home for the elderly “Aydzemnig” on Friday 29th January 2017 to perform and cheer up its resident on the occasion of the new year. The choir, conducted by Maestro Mihran and his wife Kohar Ghazelian sang some of their latest recital’s songs which they had performed on 20th December 2015 dedicated to the Armenian Hero “Zoravar Antranig”. Some of the choir members performed and sang solo entertaining the elderly and their relatives and guests. 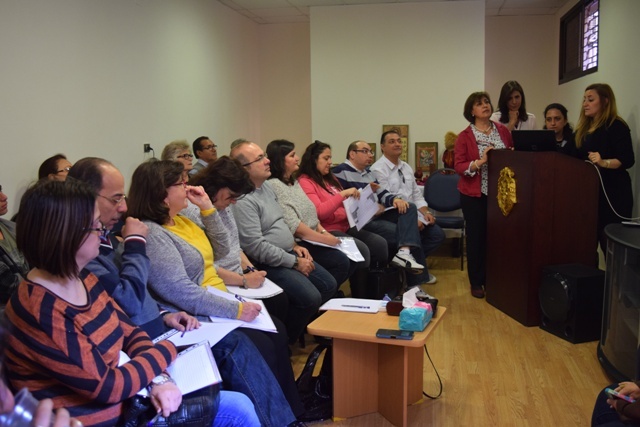 On Saturday, February 6, 2016 in a joint effort with AGBU’s Armenian Virtual College (AVC) AGBU Cairo launched the Armenian Language Hybrid Course in Egypt. This was the second such cooperation with AVC after the successful launch of hybrid class of chess during the previous year. The event was held at St. Therese Armenian Catholic Club and in the respected presence of His Grace Bishop Monsignor Krikor Kousa, Primate of the Armenian Catholic Church in Egypt, Reverend Father Hagop Hagopian from the Armenian Orthodox Church in Egypt, senior members of AGBU Cairo and Armenian Clubs. Dr. Viken Djizmedjian, AGBU Cairo Chairman, opened the event with his welcome remarks. “This is a milestone for the Armenian Community and a great opportunity for all those, who might speak Armenian but not read or write, or even speak!” he mentioned. “The system is flexible and suitable for all those who strive to learn the language and “we encourage you to participate.” The cooperation between AGBU Cairo with AVC in Egypt started back in 2013 and continues with the launch of this new project and “we anticipate a huge success”. This was followed by a detailed presentation from the AVC Ambassador in Egypt, Mrs. Anna Dolabjian-Trayan, on AVC as a global institution, and on the system of hybrid education. “I am happy to see all of you today under one roof connected with one love and passion – the Armenian language that connects us all!” she started. “The hybrid education” she explained further, “is a blend of two methods: modern online instructing offered by AVC and traditional on-site teaching back up provided by language professionals from the Community and this will be the most efficient innovative way of learning and mastering your mother language”. Mrs. Dolabjian introduced to the audience the two selected on-site community teachers. “Mrs. Lala Shamamian-Nigolian” she stated, “has joined the Egyptian Armenian Community in 2003 and since then has been very active by becoming a leading board member of Goganian Armenian Club Committee and a talented soloist in the Arax choir. Her intense popularity and perfectionist nature will surely ensure the success of these classes. The teachers, “who willingly undertook this great responsibility are in the process of undergoing teacher’s training by AVC to master all the technicalities of the program”. While the students will carry on their online studies during the week, the class will be meeting on the ground once a week at the AGBU Chaker Cultural Center (26 Mourad Bek Street, Heliopolis). Although the selected AVC language level will be for Beginners only, it is provisioned to divide the participants into two classes according to their relative proficiency in Armenian. Day of the week and timings will be confirmed. The event adjourned giving place to multiple questions from the audience keen to find out more details and a warm reception to refresh and continue the interactive discussions. The first term of the Armenian Hybrid Class is scheduled to run for three months from beginning of March until end of May. Summer might be rendered as a vacation period. The classes will restart in fall and so on. The program is jointly sponsored. While AVC has graciously decreased the fees to a nominal $40/term, AGBU Cairo is undertaking all the related expenses and is offering a further 50% discount on the presented invoices. For those interested it is strongly recommended to create your AVC accounts at www.avc-agbu.org. This will facilitate AVC Web navigation. As a second step, if you want to go on with your decision, register as a hybrid student for AL 122 Beginners Western Armenian in English Language right away to secure your place. Registrations are open until Thursday, February 25 inclusive. More details will be communicated. For inquiries contact Anna Dolabjian at anna.dolabjian@gmail.comor call directly: 01002894242. A second informative session will be held in HMEM Nubar Cairo Club on Friday, February 12, 2016 at 7:00 pm to introduce further the program to the Armenian youth eager to master their mother language! AGBU Cairo and AVC teams congratulate the community on the launch of the program and wish all students success in their studies! February is that month of the year when all the students are on mid-year vacation and off school. Once again this year, the HMEM Nubar Cairo youth committee has used this opportunity to gather the kids for some fun, sports and activities. The 3 day camp, which was organized from Thursday 4th to Saturday 6th February 2016, saw the participation of 55 campers and17 organizers and volunteers including 10 campers and 4 supervisors from HMEM Nubar Alexandria. The camp started at 2:00 pm on Thursday with the setting up of the tents and welcoming the campers and the participants from Alexandria. After dividing the campers into teams, we kick-started the fun with an adventurous game of treasure hunt in which the competitors were required to solve riddles and equations, decode messages and use their torchlights to find their way around. At 9:00 pm, having rested and after dinner, the campers gathered for an adrenaline filled “Commandos” game after which we all assembled around the warmth of the camp fire to spend some prime time together, sipping hot chocolate, eating popcorn and singing!Midnight would normally be bedtime but, through this camp, since we not only wanted to have fun and play sports, but wanted also to teach the campers the values of teamwork, courage, accountability, self-challenge and adaptability, night shifts were set. Every hour, a couple of campers would be awake guarding and securing HMEM Nubar’s flag for a possible “Hartsagoum” while the rest would be “sleeping”. The night shifts lasted till 4:00 am, which gave the campers 4 hours to sleep.Three whistles and the campers were up and standing in lines at 8:00 am the following morning. 15 minutes later, the time given to them to freshen up and wear their running shoes, they were ready and lined up in front of HMEM Nubar’s entrance gate to start their morning run to Baron Palace and back, followed by some exercises on the club’s football pitch.Later that morning, after setting the tables for breakfast, eating and cleaning up, we had a “Sations (Part I)” game planned for the campers. The game consisted of different game stations including darts, dizzy football, memory bag, tiny basketball and body shapes, the teams would go to one of the stations, play the game and gather points. The weather was perfect and sunny, an ideal day for outdoor activities. “Stations” was followed by a capture the flag game during which some of us organizers, headed to the kitchen to start preparing lunch. The lecture was captivating as we all learned about the history of our club, how it was founded and the merging between the HMEM and Nubar clubs. We learned about the birth of the various Armenian sports clubs in Egypt and how the competitions and tournaments changed and developed with time from Pan-Armenian games which included many sports to just basketball tournaments in recent decades. In the afternoon, after lunch, clean up and an hour of break, the second part of the Stations’ game started, which included competitions such as blind maze, abbreviations, Q&A, statues and stick drop. Later, before dinner, it was time for the talent show!! Some parents were there to watch and encourage. We were all so excited to see what the young talents had prepared for us. Just like last year we had so much fun, watching participants perform such acts as magic card tricks, singing, dancing and acting. We all then headed to the kitchen to serve the last meal of the day, spaghetti with tomato sauce and grilled hot dog. At 10:00 pm, we gathered once again around the campfire, this time accompanied by some of the parents. We sang some songs and enjoyed music and fire roasted marshmallows. The fun around the campfire lasted longer than planned as the campers and leaders started dancing in a mini party with Armenian, English, Arabic and Latin songs. At midnight the night shifts started, this time the campers were more excited as they were predicting a “Hartsagoum”. In fact, we did have some action and unusual events between 2 and 4AM, which brought all the campers, guards and leaders to their feet and awake to ensure protection. We were all up at 8:30 am and ready to start our last day of the camp. Again, we had our 30 minutes of morning exercise followed by breakfast. At 10:00 am we started the final game of our camp, a baseball game with a rugby ball, which turned out to be lots of fun. Then on it was time to pack, dismantle the tents and clean up. During the last hour of the camp, the organizers, leaders and volunteers gathered the campers to distribute participation certificates to all the campers and accomplishment certificates to the winning team and the outstanding campers (best camper, best spirit, most supportive, best leader & most disciplined). Finally, we took a group photo and bid farewell to our friends from Alexandria. A word of gratitude must go also to the HMEM Nubar Cairo board for their support anf fulfillment of all camp requirements and to all those who contributed for the success of the camp. Until the next camping and more great events like this. Friday, 19th February 2016 was a beautiful Lunch and Fun day at the HMEM Nubar Cairo Sports Club in Heliopolis. Families, children and young people were spread out in the green gardens to relax and enjoy the pleasantly warm and sunny February weather in Egypt. But the highlight of the day was Chess: The Brain Game, which had attracted them all! Reviving its long-time traditions and for the first time since decades Armenians of Egypt had come together to play Chess! The “Chess: Brain Games” at HMEM Nubar Cairo was initiated by AVC’s (Armenian Virtual College) certified chess players team with AGBU Cairo Chairman, Dr. Viken Djizmedjian and Mrs. Anna Dolabjian-Trayan, AVC Ambassador in Egypt. Masterminded professionally by Eddy Kassabian, AVC-AGBU On-Site teacher together with his colleagues Vartan Shoushanian, Khachig Kassabiain and Roger Mouro and after some brainstorming with Anna Dolabjian-Trayan, the activity was decided to be designed in such a way as while following the professional “battlefield” mode of this intellectual sports, it maintained the friendly nature of games and fun. The 21 participants who had registered on the event online, were divided into three age groups (less than 30, between 30 and 60, over 60) and the winners of each group received a prize (a nice chess board!) prepared by AGBU Cairo. Additionally all the players, even the winners, received a participation certificate as an encouragement and memory gift from AGBU Cairo and AVC. After some 6 6 hours of brain battle, the competitors, organizers and guests gathered to celebrate and congratulate the three winners of the three categories: Mesrob Ghazelian, Dr. Viken Djizmedjian and Khachig Kassabian. It was a great momentum bringing together Chess loving member of our community! AVC-AGBU Chess Club Egypt formed by AVC certified chess team continues its activities on regular basis, maintaining connections with AVC and its online Instructor Vahagn Kalantaryan. The next step in its development will be enrollment in AVC Chess level 3, which is expected to be launched by fall 2016. Meanwhile, all players of the community are invited to join the group by sending an e-mail to anna.dolabjian@gmail.com or a request directly on Facebook to AVC-AGBU Chess club (Egypt). AGBU Cairo organized a trip on Friday 26 February 2016 for its children’s choir members and their parents to KidZania at the Cairo Festival City in New Cairo. Kidzania, which is an internationally franchised park for children, is designed to provide an educational environment that allows kids between the ages of four to fourteen to do some role-playing, by mimicking traditionally adult activities and perform grownup’s roles in all professions; doctors, policemen, accountants, media personnel, journalists, bankers in a city that has has its own mini streets, buildings, shops, hospitals, banks, police stations, etc.. The Dziadzan children’s choir, which was founded in 2004, continues to enchant our Armenian community with their carefully chosen repertoire of songs under the leadership of Maestro Mihran and his wife Kohar Ghazelian. The Armenian Virtual College and AGBU Cairo set off the sessions of the 1st AVC-AGBU Armenian Language Hybrid Class Egypt with a Welcome Ceremony and their very first lesson on Saturday 4th March 2016 at AGBU Cairo’s Chaker Cultural Center in Heliopolis, which was specially decorated with Armenian art and craft items. 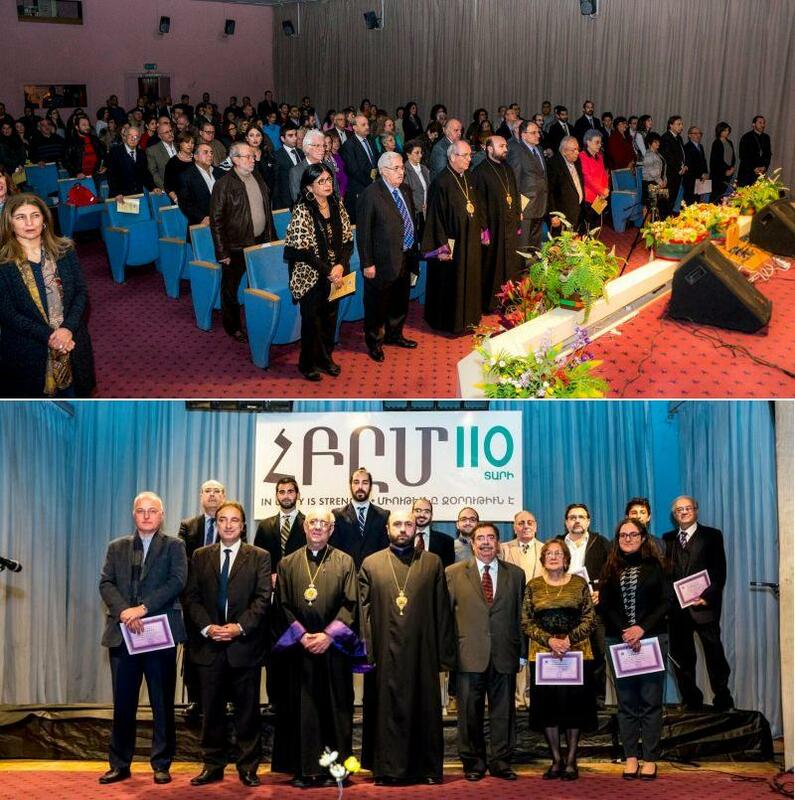 Launched under the auspices of AGBU Cairo and the Armenian Virtual College, the occasion can be considered as an important event for Egypt’s Armenian Community. The class of 26 students (diverse age and background) and its studies will be managed hand-in-hand by two on-site teachers and a class coordinator working in parallel with the assigned AVC Online Instructor,under the leadership of Mrs. Anna Dolabjian-Trayan, the AVC Ambassador in Egypt and Yerevan’s AVC Hybrid Studies Department as her counterpart, overseen by AGBU Cairo’s board and its chairman Dr. Viken Djizmedjian, with the active support and strong back up of its specially assigned board members,as well as other volunteering Armenian community members. The students will be divided into weekly morning and evening classes with one teacher and one assistant and the first term will run on Fridays until end of May. The occasion was celebrated with great enthusiasm and excitement. “On behalf of AGBU-Cairo and AVC we welcome you all in this room and congratulate you on the start of your journey with the Armenian language” started Mrs. Anna Dolabjian-Trayan in her opening speech. “I was born in Armenia and life was all Armenian until one day I moved to Egypt and departed from my land. We as Armenians in the other part of the Armenian Identity – the Diaspora – are brought here together with ourspecial passion and love for the Armenian Language connecting us all”. The floor was then given to the AVC-AGBU Teaching Staff. “I was not born in Armenia but Armenia was born in me!” started Mrs. Lala Shamamian-Nigolian, AVC-AGBU Teacher. “I was raised in Aleppo in a patriotic Armenian Community in our Little Armenia. Armenian is in my blood, in my way of thinking, in my everything! I will try to share all my knowledge with you” she continued. “My parents raised me to be a proud Armenian! I played in Armenian and I prayed in Armenian. My school was Armenian and my Club was Armenian.” stated Mrs. Sylva Bayramian-Simonian “As a passionate Armenian, I have always carried the flagship of the Armenian culture. With my Armenian husband and two children together we are building happily our little Armenian family”. “I formed my Armenian identity through my Armenian family, church and community.” contemplated Mrs. Annie-Boghossian-Tashjian in her words. “I am married to an Armenian and our little daughter goes to Armenian Kindergarten and is learning her Armenian from her teacher – Sylva herself!”. To this the audience clapped. After the Welcoming speeches the students presented themselves and explained emotionally their main goals and objectives for undertaking the course. In a casual and friendly atmosphere the words came straight from the heart and mind making it interactive and engaging. The students shared similar aspirations. “I have tried several times and really look forward to mastering it this time… I know the language and hope to get there with good practice online and in class… I speak the language but am planning to learn to read and write to make it complete…I don’t know the language but will put all my efforts to learn it for my mother.. father.. husband.. wife.. children.. grandchildren.. friends..family..etc.. Armenia as my country!” resonated they in unison. This was followed by a Skype connection with Armenia where the class was greeted and wished well by Mrs. Ani Dekirmenchyan, the AVC Online Instructor and Mrs. Arpine Tavakalyan, the AVC Hybrid Education Program Coordinator. After which the screen opened with the first lesson demo and detailed explanations by the teachers of language and technical methodsof learning and interconnection of online and onsite activities. The reception opened while the conversations continued. The audience was offered the special Armenian home-made pastry items as well as the traditional refreshing juice of the pomegranate – the symbol of prosperity and perpetuity of the Armenian nation. AGBU Cairo has just published 6 booklets of piano works by Egyptian Armenian artist Hrant Keshishian who is relishing success after the performance of the overture of his ballet “Anis El Galis” by the Cairo Symphony Orchestra conducted by Lebanese Armenian conductor Harout Fazilian in an evening entitled “Armenian flair” held at the Cairo Opera House’s Main Hall on January 9th 2016. The symphony’s creation and development by Mr. Keshishian was sponsored by AGBU Cairo ten years ago. The 6 new piano pieces come in continuation of the previous two: “Let’s Play the Piano” and “The Revolutionary Sonata”, which were published by AGBU Cairo in May 2012. Piano lovers can acquire the booklets from AGBU Cairo’s offices or through the composer Mr. Hrant Keshishian. 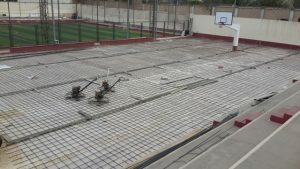 HMEM Nubar Cairo has started a complete overhaul and renovation process of its basketball court and dressing rooms with the aim of rendering the club’s basketball premises a modern mini sports complex. The court and dressing rooms were in desperate need of renovations due to the appearance of surface cracks and bumps and the detachment of some of its tiles which have been in use since March 1984 when the original sandy basketball court was replaced by tiles. The renovation works are expected to be completed by the beginning of June, in time for the summer basketball season. At first, Harout greeted the Armenian community of Egypt expressing his joy in performing in Cairo after 38 years of his singing career. Then referring to the very recent escalation of fights and the aggression of Azerbaidjan, he paid tribute to the strong army of the Republic of Armenia and of Nagorna Karabagh ,cheering the soldiers for their great bravery and heroism in their fight against the enemy, asking for a minute of silence in honour of the martyrs who are giving their lives on the Azerbaijani borders to defend our precious land. Harout then set off the party immediately with his well known charisma and appealing magnetism to draw the presence on the dance floor, dancing the night away on his well-known interpretations such as Msho Aghchig, Haye Kacher, 50 Daree, Hey Jan Ghapama and Darinere antsan. According to many of those who were present, it’s been quite some time since our community had witnessed such a lively and entertaining grand ball performance by such a high calibre artist, on the tunes of whom several generations of Armenians have lived up listening to his music and songs. It was thanks to an initiative from Cairo’s Kaghakagan (Executive committee) that this performance became reality. The singer and his 5 man band were assumed by the Kaghakagan which created an 8 man committee to take care of the sojourn details of the performers and all aspects of organisation of this big event. Under the guidance of the Kaghakagan and its chairman Dr. Kevork Yerzengatsian, the members of this committee did not spare any efforts in ensuring the perfect organisation of the event. The performer and his live band were supported in their very few moments of rest by the excellent music of DJ Armen. The food and surroundings offered by the hotel all added up in turning the soiree into a delightful event. 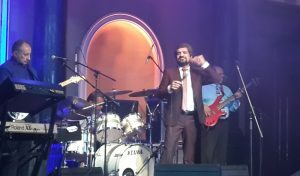 On Sunday 3rd April, Harout and his band performed again at the Belekdanian hall in Heliopolis for those who missed the previous day’s event and also for those who came to enjoy his performance one more time. It was an impressive Egyptian Armenian assembly with an exceptional performer, a combination well worth the praise and acclaim of all the presence and well worth reiterations in the near future. On Sunday 17th April 2016 at the Belekdanian Hall in Heliopolis, the guests present for the lecture and musical evening organized by AGBU Cairo on “The return of Islamized Armenians to their roots”, were spellbind from start to end during the one hour and half lecture of Eng. Raffi Bedrosyan, who was specially invited from Toronto to shed light on this curious topic which is gaining increased attention and consideration thanks to the efforts of the likes of Mr. Bedrosyan. Mr. Raffi Bedrosyan, who is a civil engineer and a concert pianist, living in Toronto, has been dedicating most of his time in recent years in identifying and helping the long lost Armenians of the Western Provinces, whose ancestors have been Islamized and converted during the Genocide years. He is the founder of “Project Rebirth”, which organizes hidden Islamized Armenians to reclaim their original Armenian roots, language, and culture. After being presented by Dr. Viken Djizmedjian, the chairman of AGBU Cairo, Mr. Bedrosyan started his emotional lecture by reminding that not all of the Armenians present in Western Armenia had been massacred or evicted from these areas during the Genocide, but a considerable number, mainly orphans, remained behind, in hiding, sheltered and converted by local families. He then talked about the reasons of the recent wave of disclosure and the importance of this acknowledgment and conversion to Armenian roots on our territorial claims which can be more effective when claimed from the population living within these lands. Mr. Bedrosian described the personal plight of many of those who had converted to their Armenian roots and the difficulties they had encountered in doing so. He showed touching pictures and videos of many such cases, shedding light also on the efforts undertaken in teaching Armenian language and history to these tens of thousands of converted Armenians through classes, reunions and trips to their homeland Armenia. The captivating lecture had intermissions of piano performance by the talented lecturer/pianist who played some well known Armenian pieces with the acclaim and applause of the audience who were fascinated by both his performance and lecture. Mr. Bedrosian who is also an advisor to the Zoryan Institute on all Turkish-Armenian issues.. has been providing the proceeds from his concerts and CDs to help converted Armenians in organizing themselves and coming out, contributing also in the reconstruction of Surp Giragos Diyarbakir/Dikranagerd Church, where he gave the first Armenian piano concert since 1915, most recently at the 2015 Genocide Centenary Commemoration. His many articles in English, Armenian and Turkish media deal with Turkish-Armenian issues, hidden Armenians and history of thousands of Armenian churches left behind in Turkey after 1915. A fascinating lecture from a very valuable and dedicated person. AGBU Cairo held its annual General Assembly at its Chaker Cultural Center in Heliopolis on Wednesday 20th April 2016. After welcoming the presence, the chairman of AGBU Cairo, Dr. Viken Djizmedjian opened the meeting with the lecture of the previous General Assembly’s minutes, while AGBU Cairo board’s 2015 activities’ report was presented by Mr. Mardiros Balayan, the board’s general secretary. Through this presentation, AGBU Cairo announced that in 2015, AGBU Cairo’s Chaker fund had spent 1,985,451 LE (compared to 1,843,611 LE in 2014) on the fund’s projects. 450 695 LE were spent on cultural projects (such as: Arek Arabic & Deghegadou Armenian newsletters, Dziadzan children’s choir, Armenia and Armenians in the Egyptian press project, published books, events at the Chaker Cultural Center, AGBU Egypt website, etc..). This amount includes also the honoraries and salaries of all specialists conducting these projects, as well as honoraries of the 5 non-Armenian researches preparing projects, thesis and magistrate degrees on Armenia related subjects. 468 749 LE were spent in 2015 for social support and medical care to 68 persons in need of such aid. 381 086 LE was spent on the Medicare project’s members. 247 287 LE were spent on educational support for the tutorial fees of 40 students, 14 000 LE for retired Armenian teachers, and 355 632 LE as financial support to different Armenian organizations and institutions. The 2016 budget was then presented by AGBU Cairo’s vice-chairman, Mr. Onnig Belekdanian, a budget which was approved by the presence. 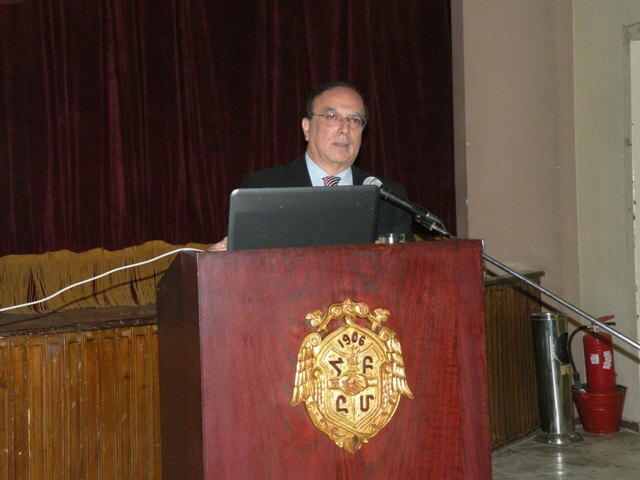 A significant event was organized by AGBU Cairo on Saturday, 7th May 2016 at the Belekdanian Hall in Heliopolis, Cairo, to celebrate the launch of the Arabic version of Dr. Raymond Kevorkian’s book; “The Armenian genocide”, and the launch of the first volume of “Armenia and Armenians in the Arab Press 1876-1923” and its related new website. Besides the Egyptian Armenian community’s dignitaries; His Grace Bishop Ashod Mnatsaganian, the Primate of the Armenian Apostolic Church in Egypt, His Grace Krikor Okostinos Coussa, the Primate of the Armenian Catholic Church in Egypt, H. E. Dr. Armen Melkonian, the Ambassador of Armenia in Egypt and the Chairmen of the Community Council and its Executive Committee, Messrs. Nubar Simonian and Dr. Kevork Yerzengatsian as well as the chairmen and members of Armenian institutions. Present also were Egyptian dignitaries, namely, Dr. Mostafa El Fekky, the well-known politician and intellectual, Dr. Mohamed Sabry Arab, former Minister of Culture as well as Egyptian journalists and the Dream TV channel. 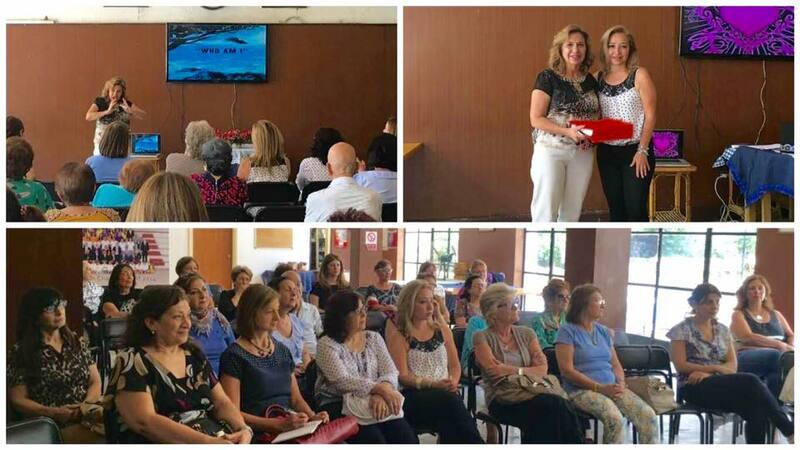 In a continuation of the series of Self Awareness lectures given by Dr. Hermine Varjabedian-Balayan, HMEM Nubar Cairo hosted the third part of the series entitled “How to heal yourself” on Friday 13th May 2016 at the Clubhouse. 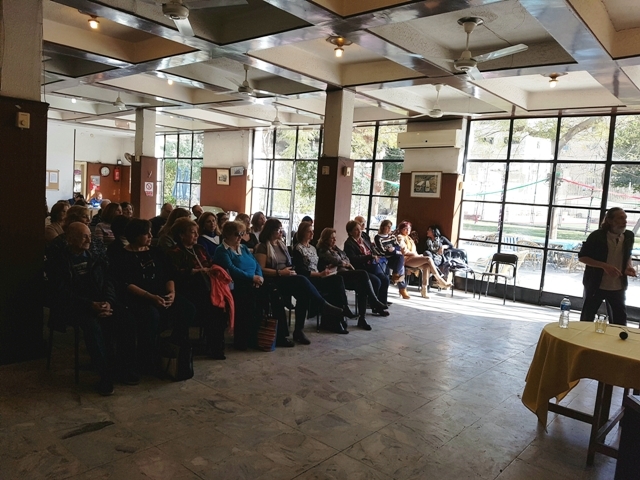 The captivating lecture shed some light on the healing power of the mind, a topic which raised many questions from the intrigued audience..
AVC-AGBU Cairo, Egypt have happily marked the First Graduation of the First Term by the First Armenian Language Hybrid Class on May 28, 2016 at AGBU Cairo’s Chaker Cultural Center in Heliopolis. The celebration ran under the title “FirstStep-FirstSuccess”. The event was opened by Anna Dolabjian-Trayan with a brief congratulating speech. “As the children celebrate their first words we are happy to celebrate here; together with our students, their first steps in mastering the Armenian language”. The microphone was then handed over to the students, each of them eager to say his/her message in Armenian. As per one of them: “How pleasant it is to say my statement in Armenian, as if my heart naturally speaks out”. The excitement increased even more when they talked directly to Dr. Yervant Zorian, the Founder and President of AVC, who pleasantly surprised the audience by appearing on the Skype connection with Armenia, along with his AVC Hybrid Education colleagues. The speeches turned into conversation and dialogue while both sides enjoyed the new level of communication reached with the use of Armenian language for the first time! This was followed by some classy violin tunes performed by Lilit Nahapetyan, including Komitas’ Hayastan and then a video clip was projected showing some of the memorable moments of these classes. It was then the time to hand out the certificates. This continued in a very cheerful atmosphere with the 23 graduate students uttering words of gratitude in Armenian while getting their precious first AVC certificate accompanied by a great gift – a book in Armenian titled “Des Khoskeret” (See your Words), a collection of paintings by the famous Egyptian-Armenian caricaturist Alexander Saroukhan. The book was presented by his family representative Mr. Garo Neredian. The concluding speeches were made by AGBU Cairo and AGBU Egypt Honorary Chairman Mr. Berj Terzian and AGBU Cairo Board Secretray Mr. Mardig Balayan who both congratulated the “unique group of graduates” and the “excellent” AVC-AGBU Egypt team headed by Mrs. Anna Dolabjian-Trayan, teachers Mrs. Lala Shamamin-Nigolian and Mrs. Sylva Bayramian-Simonian, AVC Coordintor Mrs. Annie Boghossian and AGBU Cairo Representative Mrs. Roubina Aslanian. The event continued long after adjourning with a reception and cutting of a cake branded with the AVC-AGBU Logo. While most of the students will continue their studies into Level 2, AVC-AGBU is pleased to announce new enrollments for fall 2016 for Armenian Language Level 1 and Level 2 (with test). To register you may contact Annie Boghossian at: 01223197455 or annie.boghos@gmail.com. In the spirit of FirstStep-FirstSuccess celebrations the AVC-AGBU Armenian Language Egypt First Term Graduates were invited to Saint Therese Armenian Catholic Club on Sunday, June 12, 2016. The invitation was graciously extended by His Grace Mgr Krikor Ogostinos Coussan, Primate of the Armenian Catholic church of Egypt, Jerusalem and Jordan as a gesture of encouragement, reassurance and inspiration to AVC-AGBU and all the students. The event was held in the elegantly decorated St. Therese Club main hall with a thoughtful set up for a seated dinner in a mixture of formal but very lively atmosphere. “It was just a few months ago that we were here in this same hall announcing the idea of the Launch of the Hybrid Armenian Language Classes Egypt and here we are today celebrating already our success together! We reached success because we got united with one passion – the passion and love for the Armenian Language!” opened the event Mrs. Anna Dolabjian-Trayan, AVC Ambassador in Egypt with her warm welcoming speech. “AGBU Cairo Egypt was formed 110 years ago by Boghos Noubar Pasha with a vision into the future. The AGBU-founded Armenian Virtual College is carrying the torch of that vision spreading the light of education and knowledge through its Armenian Studies around the globe.” stated Mr. Berj Terzian, AGBU Egypt in a following speech. “We congratulate the graduates and wish them further success in continuation of their studies!”. “Welcome to all AVC-AGBU Class and Congratulations!” were the starting words of the host of the event Bishop Koussan. “We at Saint Therese are very happy to have you here with us today. As a cooperation with AVC-AGBU and in support to your studies we at St. Therese will be running, during summer, weekly Armenian classes. This will be a means to strengthen your knowledge and readiness for the next term studies in the fall!” he continued. Mr. Krikor Mikaelian and Mr. Toros Khachadourian St. Therese Committee Members joined him in congratulations. Armenians of different ages gathered together to play chess once again on a warm Ramadan summer evening on Saturday, June 16th 2016. The Event was initiated by AGBU Cairo’s AVC-AGBU Chess Club Egypt and was hosted by the Goganian Armenian Cultural Club as part of the sports-themed evening. 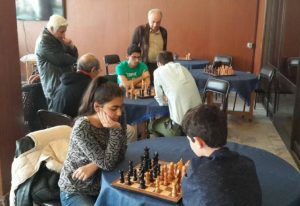 The friendly nature of the event attracted a diverse group of 22 participants of different ages and levels but all sharing the same enthusiasm for this intellectual sport so close to the Armenian culture. The event was run in a combination of professional and friendly set up keeping up on one side the seriousness of one-to-one matches between individual players while on the other side having the final win as a team product. Accordingly, the participants were divided into two groups by the color of their ribbon bands – Green and Pink and the matches were played in rounds similar to layers of the pyramid. The number of players decreased with each round reaching the top of the pyramid where one side eventually won. All precious moments were captured by the courtesy camera of Mr. Koko Shamamian. The concept was built in line with the main purpose of the Event, which was fostering the team spirit and spreading the knowledge and love for chess. The event was crowned by celebrations for the winning Green Team (Alec Varjabedian, Andranik Hagopyan, Arine Simonian, Daniel Kalalian, Eddy Kassabian, Elena Movsessian, Kevork Avanian, Khachig Kassabian, Philipe Aprahamian, Viviane Avakian), whereas Goganian board’s chairman Dr. Kevork Yerzengatsian and former chairman Mr. Nubar Simonian joined in. Participants were rewarded with AVC-AGBU Chess Egypt branded gifts: blocknotes for all (courtesy of Nubar Printing House), caps for the winning Green Team and mugs for the AVC-AGBU Teachers and Organizers of the Event Mr. Eddy Kassabian and Mr. Khachig Kassabian. “Congratulations to the Winning Team! On behalf of AVC and AGBU we appreciate the great cooperation and thank Goganian Club for hosting our Event!” addressed her short speech Mrs. Anna Dolabjian, AVC Ambassador in Egypt amid the happy cheering of the crowd. AVC-AGBU Egypt announces enrollments for hybrid classes in fall for the newly open AVC Chess Level 3. For inquiries please call Mr. Khachig Kassabian at 01222501471 or just WhatsApp or email to khachigkassabian@gmail.com the following information: Full Name, Mobile, E-mail, Facebook Name, Skype Name and Age. HMEM Nubar Alexandria’s scouts and guides organized their annual “Kermesse” on 24th of June at the club’s garden with the presence of some 150 persons. 22 fun games and contests were set up for the guests with some attractive prozes for the winners. Specially invited for the occasion were the scouts and guides of Homenetmen, the Greek Club and Wadi el Nil. The delicious food was prepared by the club’s ladies committee. The games and entertaining music continued until late hours, when the successful event with traditional lottery took place, announcing the lucky winners. 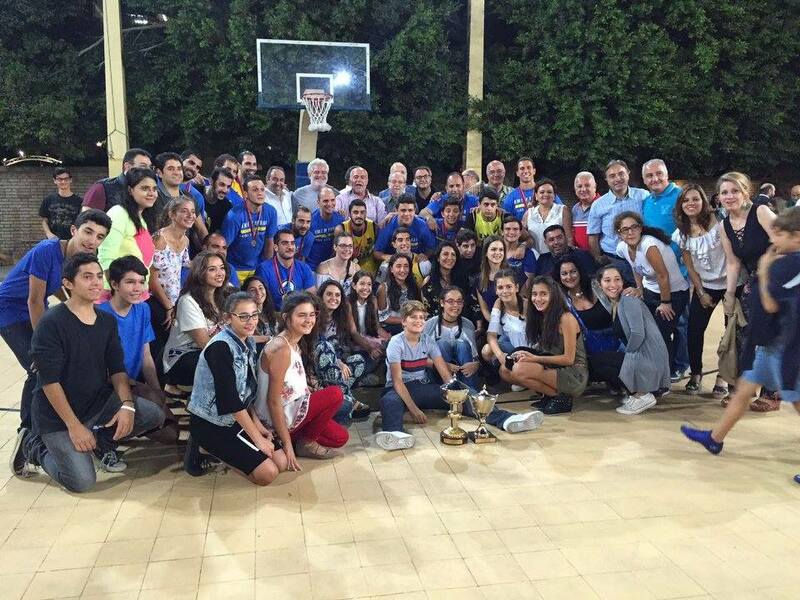 HMEM Nubar Cairo’s players lifted the trophy of HMEM Nubar Alexandria’s basketball tournament, the first cup of the Egyptian Pan-Armenian basketball tournaments of the 2016 season. In the final match, the champions defeated the hosts, HMEM Nubar Alexandria with the score of 79-58. The tournament had started on Friday 22nd July with two matches; the first between HMEM Nubar Alex and Homenetmen Gamk 61-54 (29-24) and the second between Homenetmen Ararat and St. Therese 72-52 (37-28). On Saturday 23rd July the traditional derby between the two Cairene contenders; HMEM Nubar Cairo and Homenetmen Ararat ended with the score of 58-48 (19-11, 30-23, 47-33 & 58-48). The uninterrupted reassuring lead of the winners in the four quarters of the match allowed them to withstand Homenetmen Ararat’s young players’ challenging moments throughout different periods of the match. After the match and the friendly and usual “Hard luck” and “Mabrouk” exchange of words between the players, fans and officials of the two teams, the presence took off to the Windsor Hotel “Rooftop” where HMEM Nubar Alexandria had organized an enjoyable and congenial Gala dancing dinner on the tunes of DJ Ike. Players and guest kept their feet on the dance floor until late hours of the night when the tombola prizes and their lucky winners were announced. Well done HMEM Nubar Alex and your ladies committee for this very well organized event and for this excellent choice of venue which impressed all the guests. The organisation of these parties and the success of these get-togethers on the 2nd day of the tournaments must be an incentive to other clubs to organize such gatherings. On Sunday 24th July it was time for the final match between the hosts HMEM Nubar Alex and their counterparts of Cairo. Before the final match and the introduction of the players of the two finalists, Dr. Garbis Tossounian, the chairman of HMEM Nubar Alex, thanked the presence and sponsors for their contribution in the organisation of the tournament. He also held a minute of silence in memory of HMEM Nubar Alexandria’s long time board member Dr. Arto Artinian. The cup was offered by by Mrs. Ani Artinian, Miss. Tanya and Dr. Vahe Artinian in memory of their beloved husband and father. The final match between the two HMEM Nubars came out in favour of the Cairene club 79-58 (20-17, 40-30, 62-47, 79-58). A win which allowed the champions to lift the first cup of the 2016 season. The tournament was held under the auspices of His Grace Bishop Ashod Mnatsaganian, the Primate of the Armenian Apostolic Church of Egypt and the chairmanship of Mr. & Mrs. Hratch Simonian, the Honorary Chairman of HMEM Nubar Cairo. The medals were offered by Mr. & Mrs. Vart Alexanian. Congratulations to the winners and a better luck next time to all the other participating teams. Well done HMEM Nubar Alex for the excellent organization of the tournament and the very successful gala dinner. AVC-AGBU Egypt witnessed great success with the First Armenian Language Hybrid Class of Spring 2016. Following the summer break, and in order to ensure the continuity of the Armenian Language studies, a new Beginner’s Level 1 will be introduced. It will run in parallel with the Level 2, which will fill up with the continuing students from the previous Level 1 as well as with the new enrollments, who will need to do a test for level assessment, scheduled for Friday, September 2nd, 2016 at 11:00 am at the CCC (Chaker Cultural Center) Heliopolis. The first class graduation of 23 students in May 2016 ran under the title of “FirstStep-FirstSuccess”, but every first step is followed by a second one andmore. We hope this enthusiasm will continue until our students achieve the full mastery of the beautiful Armenian language! The AVC-AGBU Egypt team lead by AVC Ambassador Mrs. Anna Dolabjian-Trayan, AVC Teachers Mrs. Lala Shamamin-Nigolian and Mrs. Sylva Bayramian-Simonian and AVC Coordinator Mrs. Annie Boghossian under the sponsorship of AGBU Cairo headed by its Chairman Dr. Viken Djizmedjian will continue their mission and are proud to announce the opening of its doors for the Fall Term 2016. Course duration is from Sep 23 to Dec 3, 2016. Special fees offered by AVC will be $40 through online payments; after which further 50% refund will be offered by AGBU-Cairo upon request. In brief, the Hybrid Education comprises of a combination of AVC online studies backed up by weekly on-site classes at AGBU Chaker Center. For the enrollments or any queries please contact Annie Boghossian at annie.boghos@gmail.com before end of August. We are looking forward for another successful term full of great achievementsas by joining our classes; you are not only registering to learn Armenian Language but becoming an importantpart of our big AGBU-AVC Egypt family. Learning Armenian will connect us all and will help us createin this hospitable land of Egypt a Little Armenia, who reads, writes and speaks Armenian! Like every year, AGBU Cairo will be contributing; through its “Satenig Chaker fund”, in the tutorial fees of school and university students for the 2016-2017 educational year. AGBU Cairo has increased its financial contribution to 10 000 LE from the previous years’ 8000 LE. Students who wish to benefit from these grants may apply at the AGBU Cairo offices in Cairo and Alexandria by filling the corresponding form, attaching 2 personal photographs, birth certificate, and past two years’ results. Those who already benefit from these grants, may continue to do so for the new educational year by presenting their mid-year A & B terms’ or end-year’s results. The deadline of application is 30th September 2016. AVC-AGBU Egypt Chess is pleased to announce the opening of enrollments for the hybrid class in fall for the newly open AVC Chess Level 3. The initiative is launched in joint efforts with AVC Hybrid Education Department and is overseen by AGBU Cairo and AVC Ambassador Mrs. Anna Dolabjian. The weekly classes will run in AGBU Cairo’s Chaker Center (CCC) in Heliopolis from October 17th to December 20th, 2016 by the onsite Teacher/Student Team comprised of Messrs. Eddy Kassabian, Khachig Kassabian and Vartan Shoushanian hand-in-hand with the AVC Online Instructor Mr. Vahagn Kalantaryan from Yerevan. The doors are open for all those who graduated from Level 2 in 2015 and for newcomers. Since this will be an advanced level, continuing students will need to do some prior exercises, while the new applicants will need to be tested for a level evaluation admission. In order to achieve the above objectives weekly workshops will be run from mid-September until the start of the term to refresh the knowledge and recharge the energy of all the players. HMEM Nubar Cairo continued its winning dash of Egyptian Pan Armenian basketball tournaments by lifting Homenetmen Gamk’s cup last Sunday after a great performance against Homenetmen Ararat in the final. In the opening game held on Friday 26th August, Homenetmen Gamk beat HMEM Nubar Alex 45-29 to qualify for the semi-final of Saturday against Homenetmen Ararat which defeated the hosts with the score of 61-48 (30-13). In the second semi-final of Saturday HMEM Nubar Cairo defeated St. Therese 76-34 (38-20). Saturday’s matches were followed by a garden dinner party which was animated by singer Roupen Saad with great talent. This long lost after-match parties are gaining ground once again in recent years; but exclusively during the tournaments organized by Alexandrian clubs. An excellent occasion to gather the youth and supporters of the five Armenian clubs in an enjoyable cheerful ambience. The final of Sunday 28th August saw HMEM Nubar Cairo’s basketballers lift the cup after defeating Homenetmen Ararat 82-55 (19-8, 42-25, 62-42). A well deserved unchallenged win by the champions against the young team of Homenetmen Ararat which is building a new generation of players. Mabrouk champs and hard lack to Homenetmen Ararat and the other participating teams. Like every year, AGBU Cairo will be awarding cash prizes to our community’s bright students who have accomplished good results in the last educational year 2015-2016. Starting from this year, laureats of Masters and PHD degrees will also be honoured. For primary, preparatory and secondary stage students prizes will be awarded for those who have obtained a 90% mark or more. For university graduates, prizes will be awarded for those who have obtained “very good” or “excellent” marks. For primary final year graduates: 200 LE. Preparatory final year graduates: 450 LE Secondary final year graduates: 1000 LE. University graduates with Very Good marks: 1500 LE and those with Excellent marks: 2000 LE. For those who have obtained their Masters degree 2500 LE and for PHD 5000 LE. Besides these cash prizes, books and certificates are given to these bright students in appreciation for their successes. Potential candidates of these awards must present photocopies of their schools’ or universities’ official results at the AGBU Cairo or AGBU Alexandria headquarters before 30th September 2016. The award ceremony for both Cairene and Alexandrian bright students will be held on Friday 9th December 2016 at the Chaker Cultural Center (CCC) in Cairo. AVC-AGBU Cairo First Armenian Language Hybrid Class is now expanding with the launch of the new semester with not only one but two levels, one for newcomers and the other for those continuing from the previous level 1. The opening of the new semester was held for both levels on Friday 23rd of September at 5:00 PM at AGBU Cairo’s premises in a small gathering as an orientation for the students. In this gathering, students got to meet and acquaint with their teachers and colleagues and conveyed their wishes and aspiration from attending these classes; all united in the their deep desire to learn the Armenian Language for different reasons, whether patriotic, in order to be more connected to their roots by mastering their mother tongue, or for familial reasons. Level 1 classes have started with teacher Mrs. Sylva Bayramian-Simonian and 14 students who attending these classes once per week; on Thursdays at AGBU Cairo’s Chaker Cultural Center. Level 2, 17 students are registered with teacher Mrs. Lala Shamamin-Nigolian, the students are divided to two classes A & B, which are held on Monday & Friday afternoons. 16 of the students are continuing from level 1 & one student joined level 2 directly after passing an evaluation exam with the teachers. AVC-AGBU Egypt team is held under the supervision of AGBU Cairo and is headed by Mrs. Anna Dolabjian-Trayan, with Mrs. Annie Boghossian Tashjian as the program Coordinator. We wish the AVC Egypt Team a successful semester and we are looking forward to see the results of all these efforts soon. HMEM Nubar Cairo’s basketballers lifted the men’s cup of Homenetmen Ararat’s Egyptian Pan Armenian basketball tournament by winning the final match against the hosts 83/51 (13-14, 35/28, 63/42 & 83/51). HMEM Nubar Cairo’s girls were also able to lift the cup of the ladies match by defeating their counterparts of Homenetmen Ararat 46/37 (12/8, 21/15, 29/22 & 46/37) after an exciting match. In the U-14 girls and boys categories Homenetmen Ararat’s juniors beat their counterparts of Al Nasr to lift the cups reserved for these matches. The tournament had kicked off on Friday 23rd September with two matches: HMEM Nubar Cairo vs. HMEM Nubar Alex 79/42 and Homenetmen Ararat vs. Homenetmen Gamk 65/35. On Saturday HMEM Nubar Cairo defeated St. Therese 81/46 (47/22) and reached the final of Sunday. The tournament was held under the auspices of His Grace Bishop Ashod Mnatsaganian, the Primate of the Armenian Apostolic Church in Egypt with HE Dr. Armen Melkonian, the Ambassador of the Republic of Armenia in Egypt as honorary guest. The senior men’s cup was offered by Mr. Bedros Mekhtigian, the senior girls cup by Mr. & Mrs. Edouard Sayan, the boys cup by Mr. & Mrs. George Zerdelian and the girls cup by Mr. & Mrs. GeorgeTorossian. The tournament was announced to be the last for Norayr Mekhtigian, Homenetmen Ararat’s distinguished and prominent player, who throughout his faithful career with the team, has always inspired respect to his team mates and opponents thanks to his courteous and gallant conduct on and off the field. A decision of retirement which will surely, and hopefully be reconsidered as his input for this young team of Ararat is extremely influential during this transitional period. Congratulations to HMEM Nubar Cairo for its double win. The basketballers of the club have proved their worth once again and have delighted their fans, a frequent occurrence in recent years, which is amply fulfilling the aspirations of the club’s fans, providing them with the gratifying pleasure and thrill of triumph. Congratulations also to Homenetmen Ararat for their excellent organization of the tournament which concurred this year with the celebrations of our motherland’s 25th anniversary of independence. 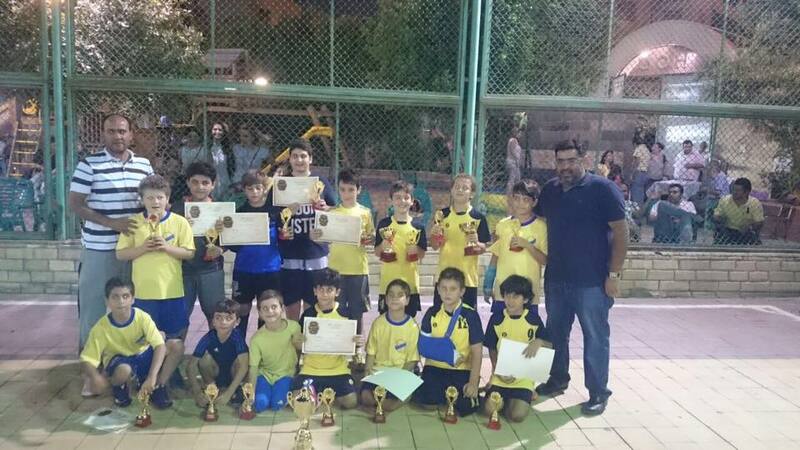 The U-10 young footballers of HMEM Nubar Cairo made an unprecedented exploit by winning the tournament organized by the HOC club with the participation of the Heliopolis regions’ churches’ sports clubs. The precious victory came after their win in the final against the hosts HOC on Friday 30th September with the score of 1-1 (P: 5-3) after coming out 1st of the group (2-3 against El Dar, 5-1 against HOC A, 10-1 against Mar Morcos). In the semi final the champs beat HOC C by 7-0. The team also collected the best player and best scorer cups, won by the little players, Jirayr Dertadian and Alek Varjabedian. The tem is coached by captain Nour and managed by Roupen Simonian. On Sunday 2nd October a small reception was organized at the club for the players, during which the young players dedicated their late team mate Anthony Nigolian’s jersey signed with their names to Lala, Anthony’s mother in a touching move, which brought tears to the eyes of the little players and all those present at the occasion. HMEM Nubar Cairo; the reigning champion basketball team of Egyptian Armenian clubs, has lifted St. Therese tournament’s trophy after defeating Homenetmen Ararat 100-59 (27-19, 45-33 , 71-44 , 100-59) in the final held on Sunday 30th October 2016. HMEM Nubar Cairo had reached the final after defeating Homenetmen Gamk on Friday, 83-46 (42-27), while Homenetmen Ararat had defeated HMEM Nubar Alex 64-52 (36-29) then St. Therese 60-52 (24-26) on Saturday. A veterans’ match was also held on Saturday between a selection of Armenian players vs. Petroleum 71-70. The tournament was held under the auspices of the primates of the Armenian Catholic and Apostolic churches in Egypt; His Grace Bishop Krikor Agosinos Koussa and His Grace Bishop Ashod Mnatsaganian. The men’s cup was offered by Mr. & Mrs. Raffi Mikalian. Congratulations to HMEM Nubar Cairo for this win and better luck next time for all other participating teams. It is to be noted that since the signature of the Egyptian Pan-Armenian rules in July 2009 this is the 26th cup out of the 28 tournaments organized and the 30th out of 33 of the past 10 years (from 2007 to 2016). AGBU Cairo has opened the registration and renewal of the 2017 membership of its Medicare program, which is entering its 17th year of existence. Registrations and renewals are open from 1st November until 10th December 2016. AGBU Cairo had registered 285 members from cairo and Alexandria for its 2016 Medicare program. Through this program, besides the 50% discount on their medical, surgical, pharmaceutical, dental, and various medical fields’ expenses, members benefit from their own choice of doctors, hospitals and pharmacies without being limited to the contracted institutions which give AGBU Cairo Medicare program members, additional discounts. The regulations were established in 1999 and the program was launched in January 2000 for Cairo`s Armenian community and was extended two years later to the Alexandrian Armenian community. A specialized subcommittee meets regularly to govern and review the members’ submitted documents and to discuss issues and raises in AGBU Cairo’s financial contribution. The program is made possible for the needy Egyptian Armenians thanks to the Satenig Chaker fund which provides numerous educational, social, cultural, sports and assistance services to the Egyptian Armenian community through several specialized committees. Application forms can be obtained from the AGBU Cairo and AGBU Alexandria offices or can be downloaded from our website. For new applications, a photocopy of the personal ID, 2 pictures and an Egyptian Armenian community membership document must be presented, while for renewals, a personal picture and a photocopy of the 2016 Medicare ID card will be required. The membership fee is 180 LE. The applications and renewals are submitted at the AGBU Cairo offices in Heliopolis from 10:00 am to 3:00 pm every day except Sundays, on Fridays at the AGBU office in the Armenian Patriarchate from 10:00 am to 3:00 pm and in Alexandria by contacting Mrs. Zevart Kartalian 01223110673. All applications are subject to the approval of AGBU Cairo. AGBU Cairo organised on Friday 9th December 2016, its annual Egyptian Armenian bright students’ awards ceremony at HMEM Nubar Cairo. 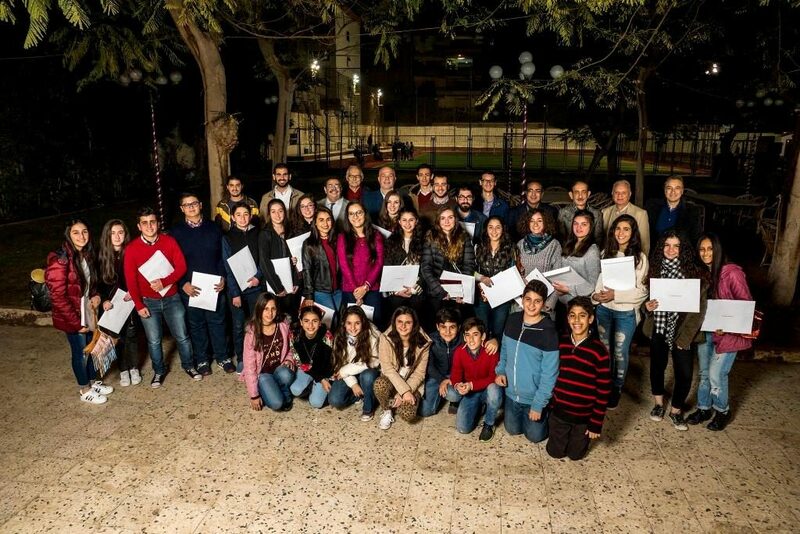 Certificates of excellence, presents and cash prizes were given to Cairo’s and Alexandria’s Armenian students who have accomplished distinguished results in the 2015-2016 educational year. The awards, which are distributed since 2001 thanks to AGBU Cairo’s Satenig Chaker fund, comes as an appreciation and encouragement to our community’s bright students’ educational achievements. This year 38 students were awarded, 23 from Cairo and 15 from Alexandria which included graduates of the past 3 years. For Primary Stage students, from Cairo 8 graduates were awarded: Sassoun Gerboyan 90.6%, Armen Jamgotchian 92.3%, Sevan Baltayan 93%, Chris Kellayan 94.8%, Lia Nigolian 94.9%, Mher Koehnelian 95.5%, Noune Torossian 96.8% and Antranig Hagopian 98.8%. From Alexandria in the same category: Christine Wassef 90.6%, Alodara Khosrof 92.2%, Vahram Tossounian 92.6%, Lousin Mazloumian 92.8%, Khatchig Papazian 94.3%, Melissa Tadjerian 96.2%, Garo Baharian 96.7% & Berdj Topalian 98.8%. For the Preparatory stage, 4 graduates from Cairo were awarded: Lillit Sayan 94.5%, Joel Shakardjian 96.4%, Nathalie Godoloshian 96.6% and Rita Chamkertenian 97.6%. From Alexandria in the same category: Sevan Mardigian 97% & Melanie Topalian 97.1%. For the Secondary stage graduates the 4 graduate students were Marianne Apikian 3.91 (Am. Diploma), Christina Antreasian 95%, Julia Avanian 3.99 (Am.Diploma) and Mane Djizmedjian 17.44 (Exclnt.) French Bac. From Alexandria in the secondary stage: Nathalie Topalian 90.7%, Raffi Kalaydjian 97%, Armen Giridlian 97.5% and Aline Kavougdjian 103%. For University graduates from Cairo the graduates with the grade Very Good were Vartan Terzibashian, Apraham Boyadjian and Raffi Soultanian and those with the grade Excellent were Lucie Sandjian and Yeram Torossian. From Alexandria Saron Khounganian graduated with the Excellent grade. Holders of Masters and PHD degrees were awarded for the first time: The graduates were Marie Iskenderian (Masters) and Haro Karkour (PHD). The awards were handed out to the students through the board members of the AGBU Cairo and the chairman of AGBU Alexandria. Before the award proceedings a word of encouragement and congratulations was made by the chairman of AGBU Cairo Dr. Viken Djizmedjian. Three short films were then screened about three important learning institutions of Armenia (Tumo Center, Dilijan’s United World College and the American University of Yerevan) . Besides the certificates of appreciation, books were awarded as well as cash prizes: For Primary stage graduates: 250 LE, for Preparatory stage students: 500 LE and for Secondary stage graduates: 1000 LE. The cash prizes are for those who have obtained marks of 90% and more. For university graduates with “Very Good” grades the prize is 1500 LE and those with “Excellent” marks it is 2000 LE. For Masters the cash prize is 2500 LE and for PHD it is 5000 LE. HMEM Nubar Cairo hosted an interesting lecture on the principles of Yoga, objectives, practices and benefits in a healthy gathering at the club house on Friday 16th December 2016. The guest speaker was none other than the club’s longtime regular Vasken Exerdjian. The get-together was the occasion for the presence to be more informed about the benefits of yoga and the hazards of the food we eat and its impact on our wellbeing, as well as the importance of a balanced food/mind way of living. The lecture was accompanied by explanatory posters and drawings which enhanced the attention and comprehension of the explained topic. After the end of the lecture and the speaker’s answer to the questions of the audience, a souvenir gift was given to Vasken by Dr. Hermin Varjabedian on behalf of the club’s board. A healthy delicious vegetarian diet prepared by the club’s ladies committee was then served. The traditional annual Christmas bazaar of HMEM Nubar Cairo was held on Friday 23rd December 2016 at the club in a cheerful and festive atmosphere. The Christmas food & decoration bazaar was opened at 1:30 pm by Mrs. Kohar Varjabedian-Vartougian, who was the guest of honour of this yearly festive event. Besides the Armenian food & delicious treats there were some Christmas decorations and superb knick-knacks. On sale there were many delicious items like Mante, sudjuk & pastrami, the palate-tempting Tchoerek, Kété, and Topig and the excellent choice of the pastry section of jams, Christmas cakes, muffin and cookies, which all went out of stock in no time in spite of the abundance of the quantities. The ladies committee of HMEM Nubar Cairo did a tremendous job in preparing the event and gathering the skilful Armenian ladies to prepare the Mante and the food displayed in the bazaar. They worked hard during the past few weeks to ensure the success of this event. Soon after the delicious lunch prepared by the newly appointed chef, the infamous gift distributing Gaghant Baba showed up to the joy of the children. 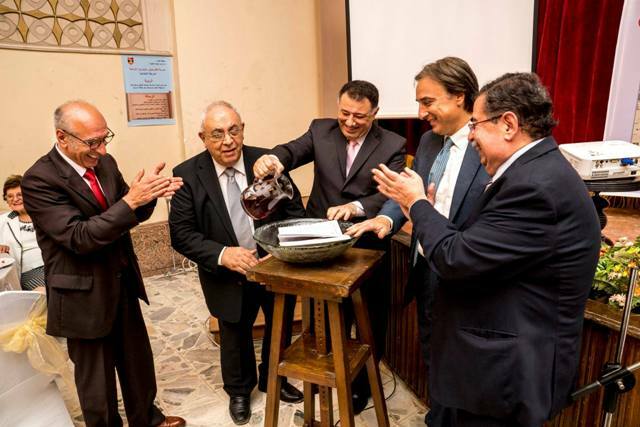 AGBU Cairo celebrated the 110th anniversary of AGBU on Sunday 11 December 2016 at the Heliopolis Association’s Library with some special proceedings marking this important Jubilee of our Union which was founded in 1906 in Cairo. The celebration was held under the auspices of His Grace Bishop Ashod Mnatsaganian, Primate of the Armenian Apostolic church of Egypt and His Grace Bishop Monsignor Krikor Agostinos Coussan, Primate of the Armenian Catholic Patriarchate, and HE Dr. Armen Melkonian the Ambassador of the Armenia in Egypt with the presence of our communities’ dignitaries and representatives of different cultural, sports and philanthropic organizations, in a much appreciated sign of solidarity with AGBU. After playing the National anthems of Egypt and Armenia and AGBU’s hymn, the evening started with the welcoming words of Mrs. Lala Nigolian, who asked the presence for a minute of silence in memory of the victims of the Coptic Cathedral church’s bomb blast. AGBU Cairo’s chairman Dr. Viken Djizmedjian was then invited to give his speech in which he explained the ideology of the Union and the scope of activities of AGBU in general and AGBU Cairo in particular. Following Dr. Djizmedjian’s speech, Mr. Onnig Belekdanian, chairman of AGBU Egypt’s District Committee, read the message of the President of AGBU, Mr. Berge Setrakian, directed to AGBU Cairo on the occasion of the 110th anniversary of the Union. A documentary film was then screened about the founders, the creation and history of AGBU and its scope of activities in the Diaspora, Armenia and Gharapagh through its 110 years of existence. 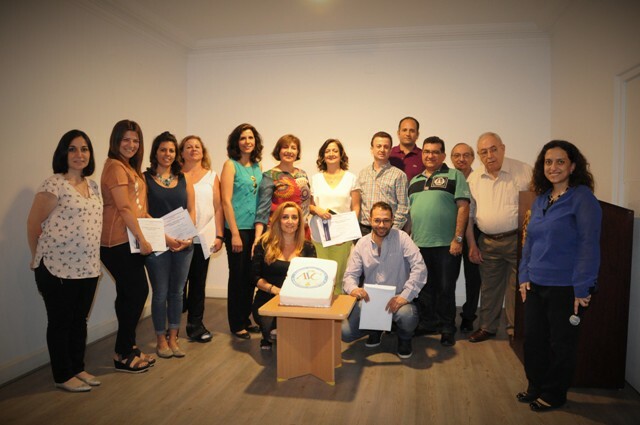 Certificates were then awarded to the veteran members who have completed 20 years of membership in AGBU Cairo. A practice which AGBU Cairo performs on each anniversary commemoration celebration. The 16 AGBU members who were awarded were: Satenig Apkarian, Levon Avakian, Arto and Saro Belekdanian, Levon Der Hagopian, Hrayr Dertadian, Suzanne Hamamdjian, Hraztan Kalenian, Hrant Keshishian, Arpi Khatcherian-Habash, Shahen Mazloumian, Vicotria Mazloumian, Annie Tashdjian, Ari and Saro Yerzengatsian and Siranoushe Yerzengatsian. Following the award ceremony, AGBU Cairo’s Dziadzan children’s choir came on stage to sing five lively songs under the leadership of Maestro Mihran Ghazelian and the artisitic management of Ms. Kohar Ghazelian with the assistance of Mrs. Suzanne Karkour who coordinated the children’s dances. After the performance of the choir, Mrs. Lala Nigolian invited the Ambassador of Armenia to Egypt, Dr. Armen Melkonian to hand out to Maestro Mihran and his wife Kohar Ghazelian the certificate awarded by the Ministry of Diaspora of Armenia for the third place AGBU Cairo’s Dziadzan children’s choir had won in the “Armenian identity preservation for cultural troupes” contest. The final item of the program was the Quartet performance of the Armenian violinist Giorgi Harouchounyan and his colleagues who performed Mozart and three Gomidas classical works to end up this ceremonial in celebration of the 110th anniversary of AGBU. Another step forward by AVC-AGBU Egypt with the Fall 2016 Term graduation. The occasion was celebrated on Saturday, December 17 in AGBU Cairo’s Chaker Center Heliopolis and was attended by the AVC-AGBU Teaching Staff, Senior Members of AGBU Cairo, the students and their close ones. Welcome Speeches were held by Dr. Viken Djizmedjian, Chairman AGBU Cairo and Mrs. Anna Dolabjian-Trayan, AVC Ambassador, which was followed by warm words of congratulations from AVC Hybrid Department in Armenia. The students were willing readily to speak to AVC in Armenian and express their happiness for learning this beautiful language. “We congratulate your achievements in harnessing our challenging but rich language with the efforts of our excellent teachers Mrs. Lala Shamamian-Nigolian and Mrs. Sylva Bayramian-Simonian!” stated Dr. Viken Djizmedjian. “The simultaneous graduation of both the Armenian Language and Chess Departments marks our transformation into a fully-fledged AVC-AGBU Egypt Hybrid School.” announced Mrs. Anna Dolabjian-Trayan. The speeches were followed by Armenian folkloric music heard from the guitars of a young Venezuelan-Egyptian duo after which the 29 Language and 7 Chess students received their well-deserved certificates. Outside in the hall the festive pre-Christmas and New Year atmosphere prepared by Mrs. Hasmig Kazzazian was waiting for the audience with tasty refreshments and a Christmas buche while the unexpected visit by the Armenian Gaghant Babacarrying a box of good luck chocolates created muchexcitement and fun. The AVC-AGBU Egypt continues to grow. Winter term 2017 will be marked by three levels of Armenian Language running Feb 16 till May 11, 2017. Contact Mrs. Annie Boghossian-Tashjian, AVC Coordinator for details and enrollmentfor any of the three levels at: 01223197455. As for Chess, the Level 3 graduates will continue weekly practice on Fridays under direct supervision of teachers Eddy Kassabian, Khachig Kassabian and Vartan Shoushanian in class for all supporting the lower levels to move up to the next stage by continuing the online studies with AVC. For enrollment with AVC or even just practice with the group on Fridays contact Khachig Kassabian at: 01222501471. All ages are welcome. Former and current members of AGBU Cairo’s Dziadzan children’s choir members reunited on Friday 30th December 2016 at the Chaker Cultural Center in Heliopolis to celebrate the choir’s 12th anniversary and to celebrate the arrival of the 2017 New Year. 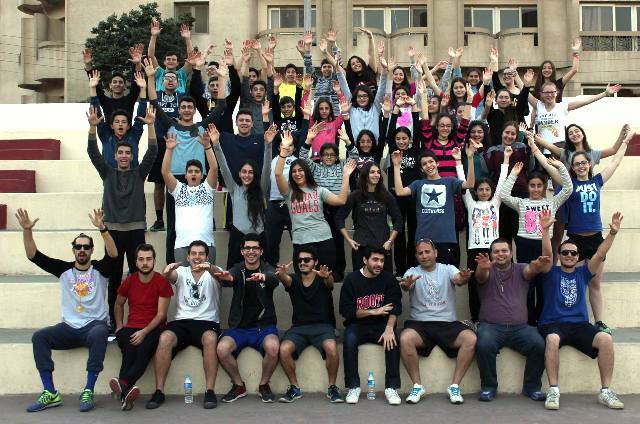 The reunion which was held with the presence of the chairman of AGBU Cairo, the officials of the choir, many former and current members who reach amount to more than a 100 throughout the choir’s 12 years of existence was a wonderful gathering full of fun, games and laughter. The evening started with the welcoming words of Maestro Mihran and Mrs. Kohar who welcomed the members and stressed on the importance and the joy of gathering and learning & singing Armenian songs. Former choir member Aspé Djizmedjian then projected a slide show and video film of the choir’s past performances to the delight of the choir members who were amused and fell about the sight of their looks of earlier days. The evening continued with a game of quiz about Armenian songs through pictures and music projected on the screen, followed by the visit of Gaghant Baba who distributed presents to the children and who had the choir members sing many of the songs they had learned in the past. It was a fun filled gathering enjoyed by the children… and even more by the grownups..